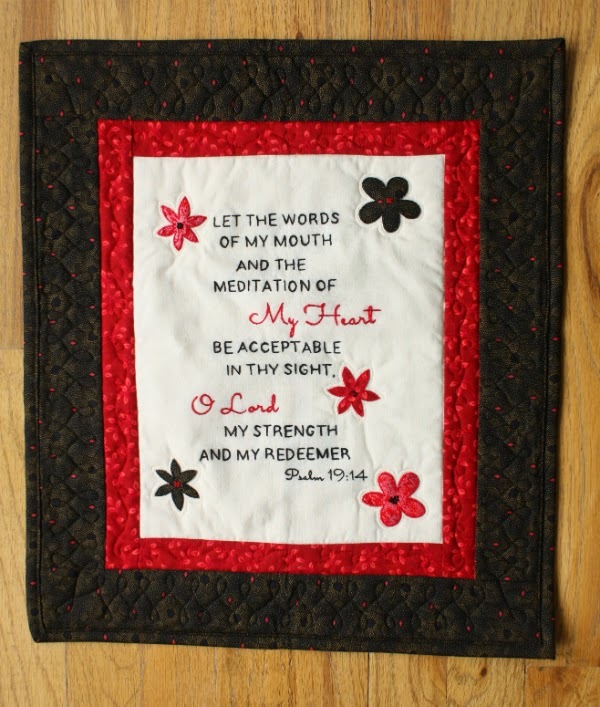 I finally finished my second Psalm 19 mini quilt! 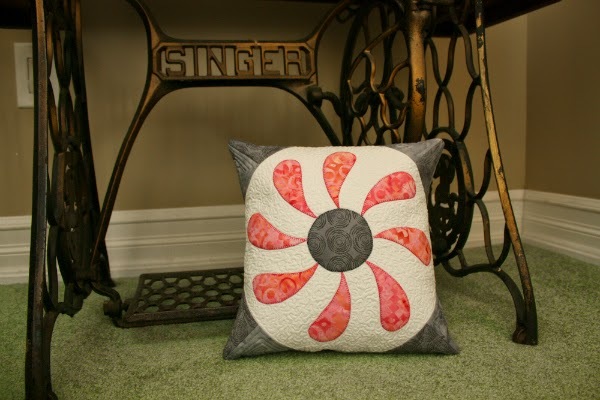 I made this for Gail, who blogs at Notion Nanny, as a Craft it Forward gift. 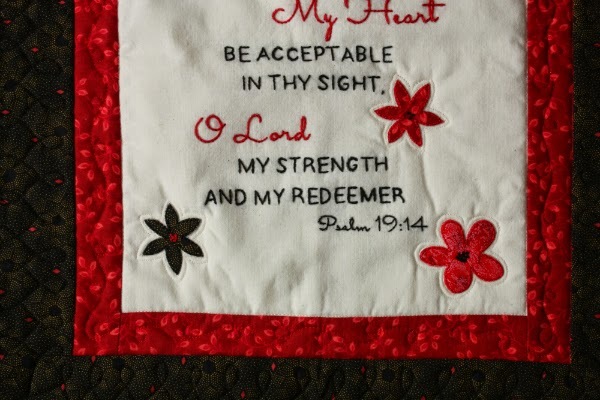 My first Psalm 19 Mini Quilt is available in my Etsy shop. 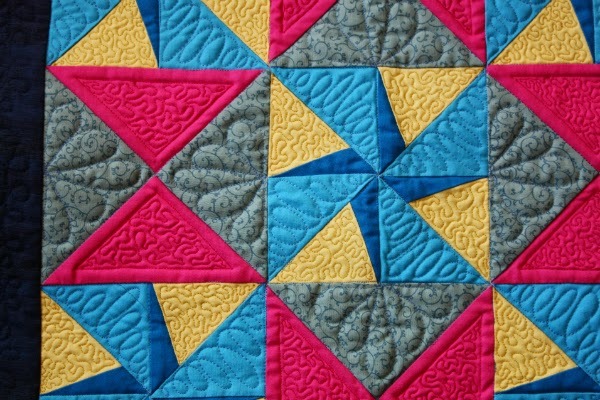 I did very simple quilting in the center since I wanted the embroidery to be the focus. 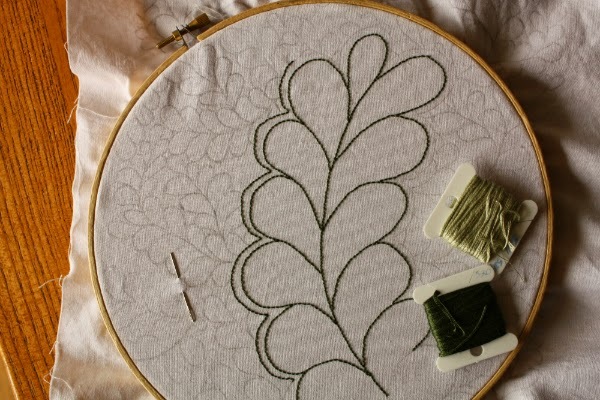 I stitched in the ditch and outlined each flower, then echo quilted once around each flower. The rest of the quilting shows up much better on the back. 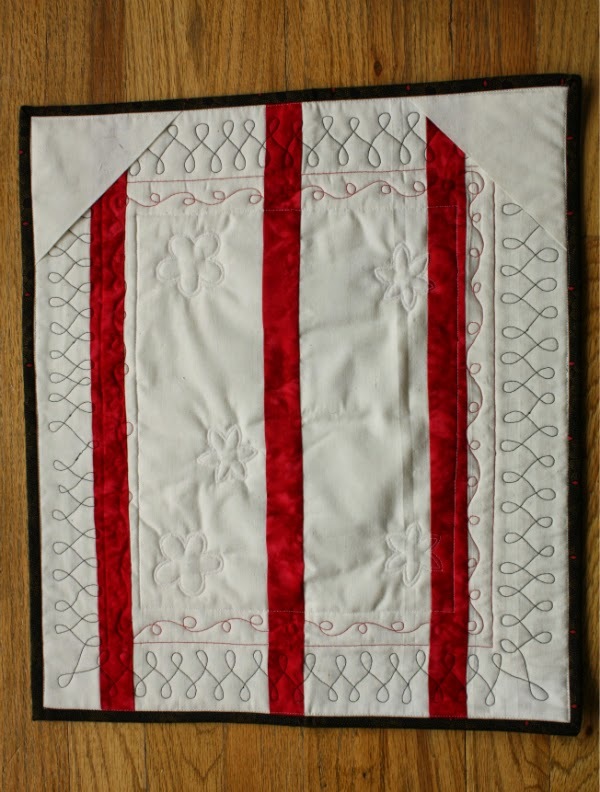 Loops in the inner border and wishbones in the black border were quick to stitch, and I'm really pleased with how it looks with the red strips of fabric I used to stretch the backing fabric I had on hand. A couple of hanging triangles in the corners and it was finally finished! 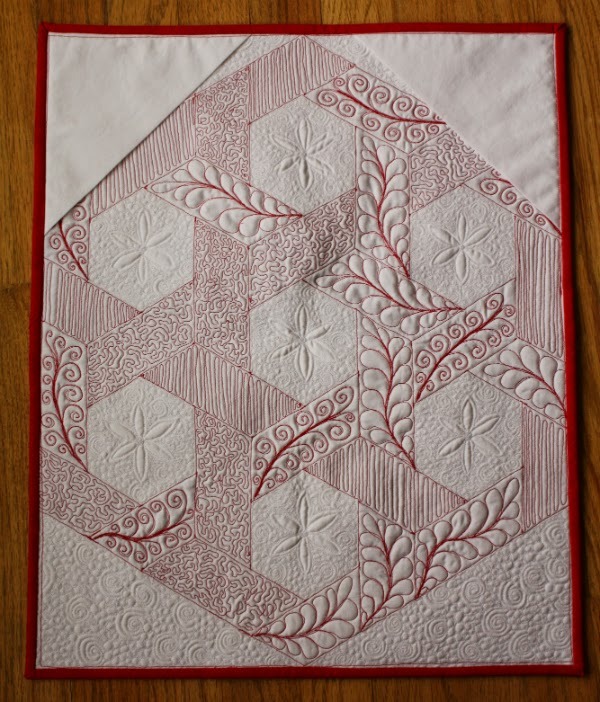 This is my second finish for this quarter of the Finish-a-Long (the first was Renee's quilt). Hmmm, only two of five...I guess I better get sewing! I love spending time in the kitchen. I enjoy chopping things, mixing, tasting and creating something yummy. I love when people walk into the house and say, "Mmmm, smells good in here. What did you make?" Whether it's spaghetti sauce, brownies or peanut butter blondies, I like making food to share. I do most of my baking from scratch, stirring flour, sugar, cocoa and more together to create the chocolate cake I've made so many times I don't need the recipe anymore. I've given up on making a single batch of muffins because 12 just doesn't stretch very far when you're feeding a family of 5 and we all love muffins. I love making breads too. I don't make our regular everyday bread because...well, we're a family of 5 and we love bread too! I don't even want to think about how many loaves I'd have to make to keep up with the demand. I do make the bread we use for garlic bread, though. I make our pizza dough from scratch every week and I make challah bread (which is delicious as toast). Have you ever noticed that Jesus used regular, everyday examples of things when He taught? He said, "The kingdom of heaven is like yeast that a woman took and mixed into about sixty pounds of flour until it worked all through the dough" (Matthew 13:33). A woman making bread. Every person listening to Him would have either made bread themselves or they'd have been around a woman making it. It's easy to see, isn't it? I do confess I have trouble imagining needing sixty pounds of flour at one time, though! It wouldn't have taken nearly as much yeast, of course. My pizza dough recipe calls for about 2 1/2 cups of flour, but only 1 tablespoon of yeast. Yeast is quite amazing, when you stop to think about it. Such a tiny amount, and yet it makes the whole batch of bread dough rise so beautifully. How is the kingdom of heaven like yeast? First of all, let me say that the kingdom of heaven is, right now, within the hearts of believers. We who have the Holy Spirit living within us, who have received Jesus as our Lord and Savior, we are the kingdom of heaven. Being compared to yeast makes me think of the influence yeast has on the rest of the ingredients in the recipe. It's only a little bit of yeast, but it is enough, and it makes the whole batch rise. Without the working of the yeast, the bread would be hard, dense and not at all something we would want to eat. As Christians, our influence should work like yeast, lifting and raising the society around us to look more like the God we serve. We influence the people we are around each day, the ones who see how we handle different situations, what sort of language we choose to use and how we talk about other people. Are we, by our Christ-like behavior, being a positive influence on those around us? Though believers may be outnumbered, we, like yeast, can change our society for the better if we truly follow Jesus' teaching to the best of our ability. Unfortunately, there are some Christians who feel the need to badmouth anyone who doesn't agree with them, or who doesn't follow the same set of rules they follow. Some of those Christians are so loud and disagreeable that they have given all Christians a bad reputation for being judgmental, narrow-minded and arrogant. That's not at all the influence Jesus wants His followers to have. Jesus compared that sort of religious people to yeast too, but that comparison had a different tone. "Be careful,” Jesus said to them. “Be on your guard against the yeast of the Pharisees and Sadducees" (Matthew 16:6). The Pharisees and Sadducees, the religious leaders of Jesus' day, were very strict. There was only one right way to do things and it was their way. Their way had no compassion for people, no grace, no kindness. Jesus' harshest words were directed at these people who should have been closest to God, who should have been the first to recognize Jesus when He came, but who were actually the farthest from God because of their self-reliance. Just as the kingdom of heaven (believers who live the way Jesus intends) can positively influence society, so those who profess to believe but cling to man-made rules (and insist everyone else must follow them too), can influence negatively. 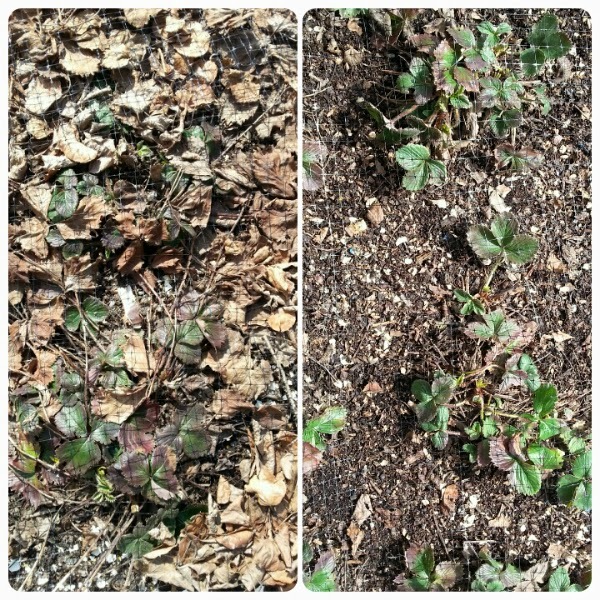 Either way, it takes only a little influence to spread throughout a whole family, or church or community. The question is, which sort of influence are we spreading? 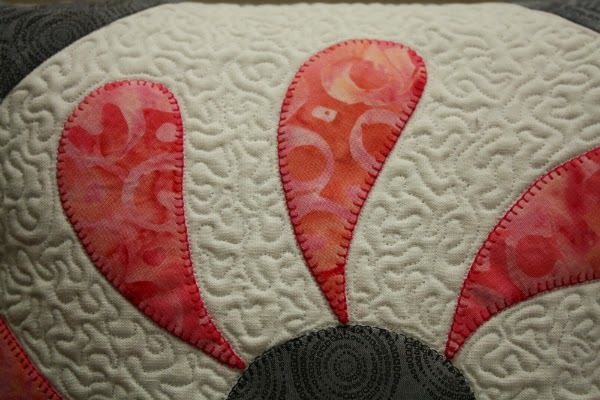 Now that Renee of Quilts of a Feather has received her quilt, I can share the whole thing with you. 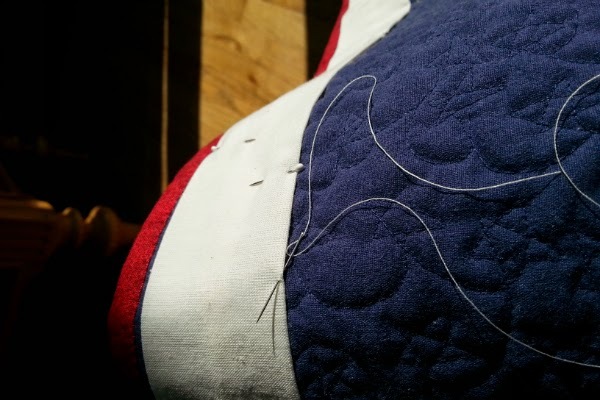 Secret sewing is hard! 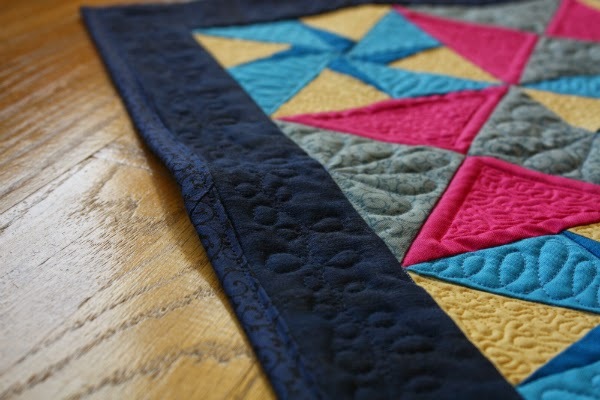 I kept sharing little sneak peeks, but now here is the whole quilt. Like so many quilters, I love starting new projects, but I've been trying to keep that to a minimum because I have so many things I want to finish. So, when Victoria (@sewgoclimbing on Instagram) posted a beautiful picture of an epp block she had made based on the woodworking of William Brad Davidson (@wbraddavisdon on IG) I really, really wanted to make one like it, but I tried to resist because I didn't need to be starting something new. But then I remembered the swap I would soon be doing with Renee. Since I don't think Renee does epp, it seemed like the perfect opportunity to try a new block and make something Renee wouldn't make for herself. 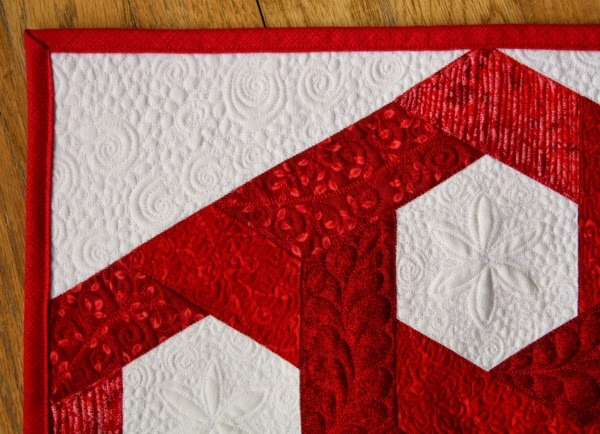 Renee said red is one of her favourite colours, but it doesn't often make its way into her quilts, so I used four different red fabrics and a solid white. Along with lots of sewing at home, the epp went with me to Nova Scotia for my brother's wedding, so I could stitch on the plane. 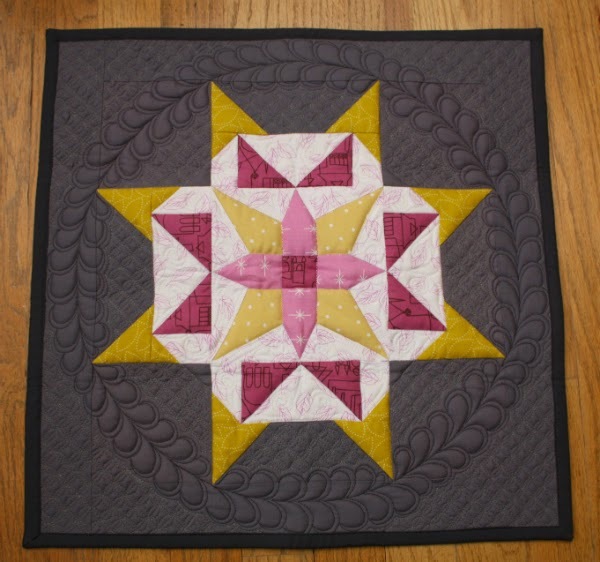 Once the top was finished it was time for some fmq! 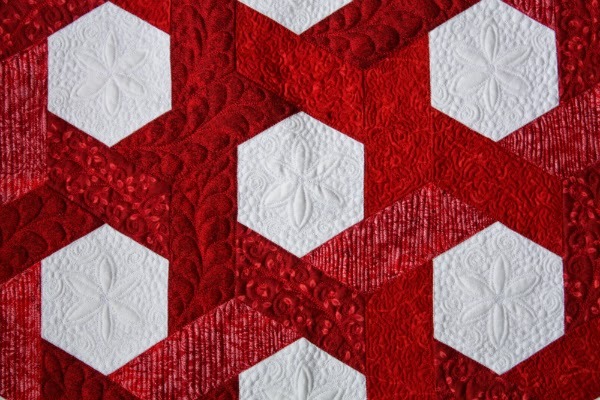 I have to admit that I was a little nervous about doing the fmq on this one. 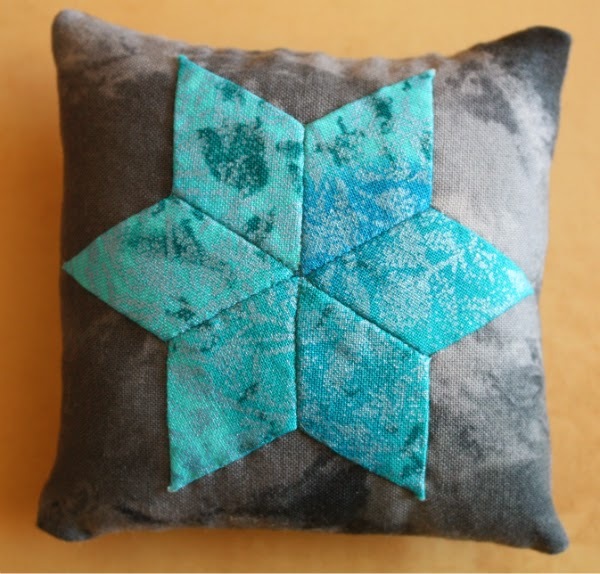 Have you seen Renee's fmq skills?? 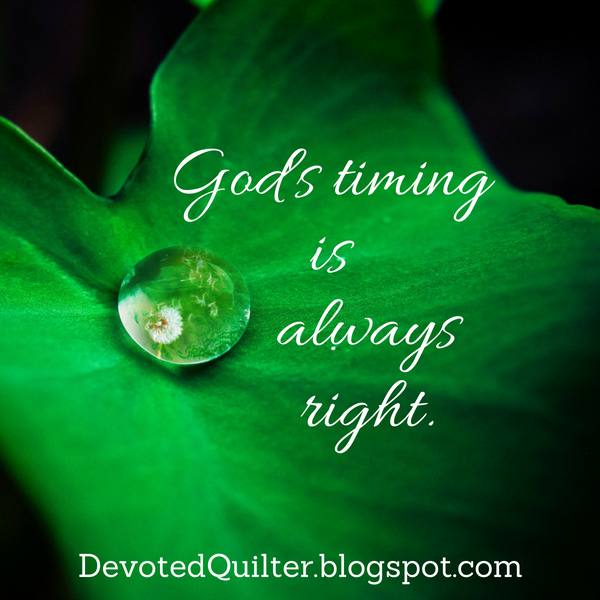 If you haven't, then I highly recommend you check out her blog. 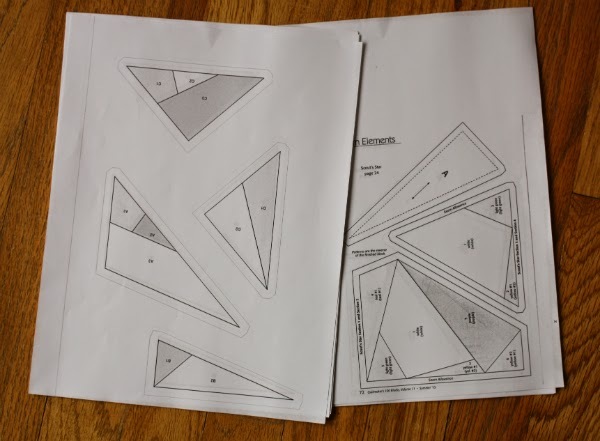 It was Renee's fmq that first drew me into her blog, with this post from almost exactly two years ago. 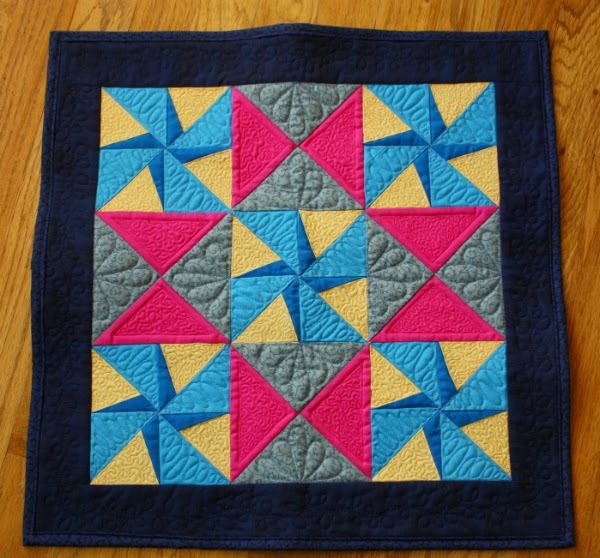 My fmq skills were in their infancy and Renee simply blew me away. 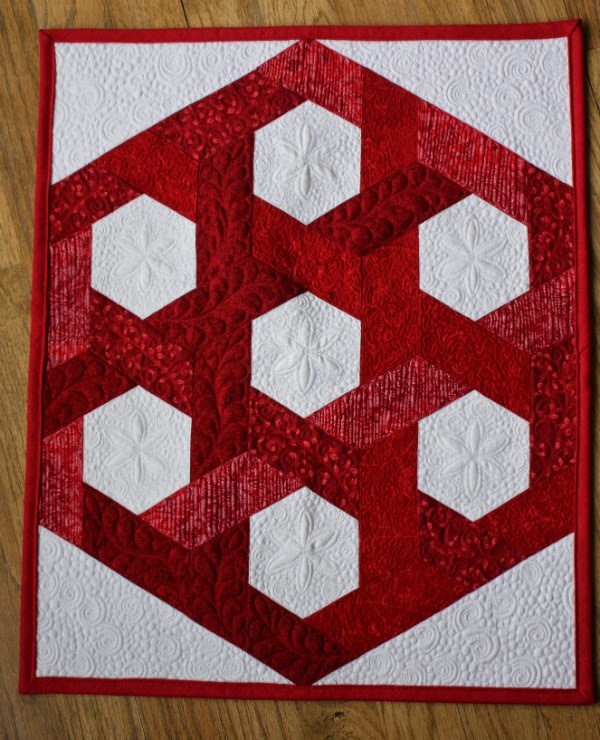 Victoria's block finished at 10 1/2", with 1" hexagons, but I wanted mine to be bigger so I'd have more room for quilting. I doubled the size, making 2" hexagons, which gave me room for flowers, lots and lots of pebbles and a few little swirls. 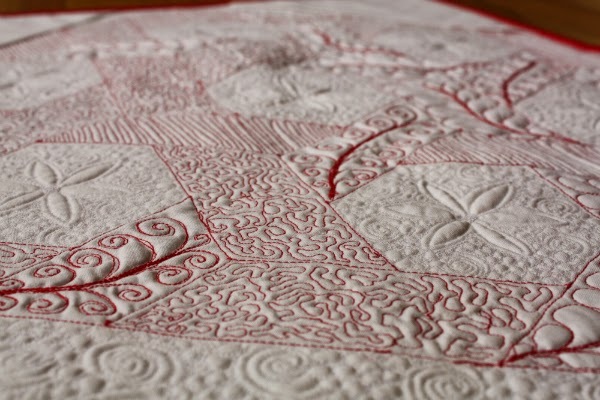 I added corners to the block to make the quilt a rectangle, and continued the many, many pebbles and swirls in the corners. If practice makes better, then my pebbles are now several hundred better than they were a month ago! 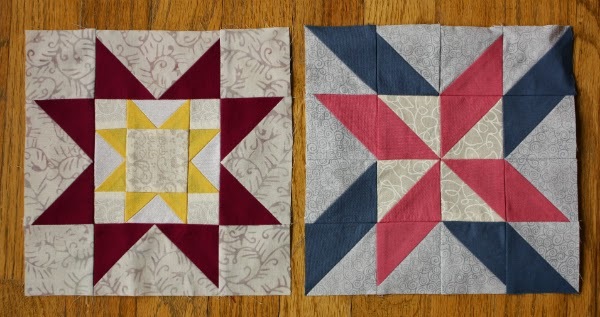 I also had fun choosing different designs to go in each of the four red fabrics. The red thread really shows up on the solid white back! I love how well the different designs stand out on the back too. 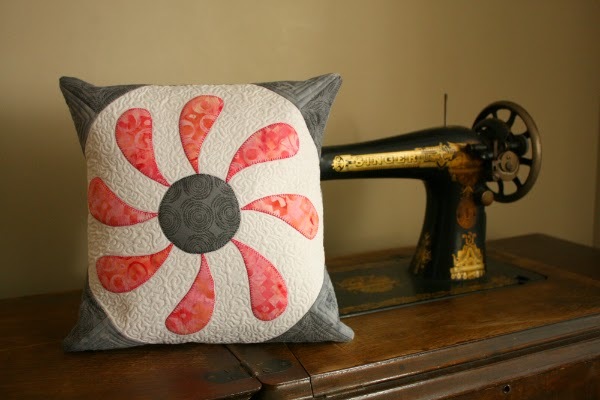 Along with the quilt, I sent Renee this little pincushion. Grey and teal is her favourite colour combination, so I had to send something using those colours! When Renee's package to me arrived in the mail, walking home from the post office was torture because I didn't want to wait to open it! 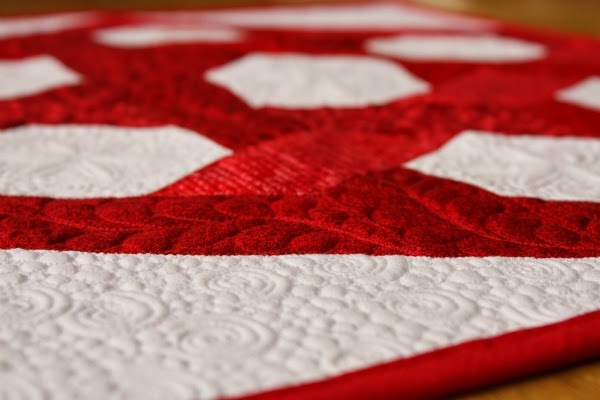 The quilt she made me is perfect, and her quilting is just as beautiful in person as it looks on my computer screen. Just look at that feather wreath - isn't it gorgeous? Now I just have to get a dowel so I can hang this beauty on the wall where it belongs!